Tree stumps are an unsightly hazard that can hinder landscaping upgrades, attract pests, and pose a tripping danger. Simply removing or grinding a stump can elevate the look of a yard and create more landscaping options for a homeowner or property manager. However, clean and complete stump removal can be a difficult task, requiring specialized equipment and in-depth knowledge. DIY removal often causes damage to the surrounding landscape or injury to the DIYer. Here at Cascade Tree Works, we pride ourselves in always offering competitive prices for all of our stump removal and stump grinding services. Our employees specialize in tree stump removal, so you know you are hiring professionals with the credentials to back them up. Improve your yard’s overall look and safety today. Call Cascade Tree Works to schedule your stump removal and grinding service. We proudly serve South Washington cities including Vancouver, Battle Ground, Salmon Creek, Woodland, and LaCenter. Tree stump grinding is a great option for anyone hoping to remove a stump from their yard or garden. In most cases, stumps are ground 4-6″ below grade, unless the customer requests the stump be ground to replanting depth. Once the tree stump has been shredded into wood chips, you can pay an extra fee for us to dispose of the debris – or you can do so. Either way, you will then have the opportunity to lay sod, replant a tree, or redesign your landscape. We require a 34″ opening to access the area and we can only grind up to 4 inches away from obstacles such as utilities and free-standing structures. Due to a wide variety of differences, stump grinding requires a site visit. Professional stump removal is often a safer and greener option. Many DIYers purchase damaging chemicals to expedite the rotting process or burn the stump. While both options leave you with a stump-free yard, they will likely damage the surrounding landscape. Additionally, chemical stump removers can harm local wildlife, pets, and anyone who encounters the stump for several weeks. Here at Cascade Tree Works, we utilize one of the two most common stump removal options: either stump grinding or digging the stump up. Both techniques are effective; however, stump grinding is most commonly used to minimize damage to the landscape. 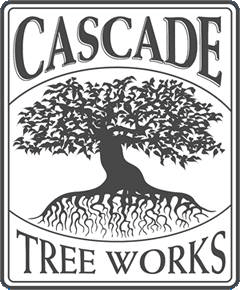 At Cascade Tree Works, we are proud to offer competitive prices for stump removal services. Pricing is calculated per inch, with a $140 minimum for all stump grinding jobs.